Ads by Fraven is an ad-supported browser extension that affects popular browsers like Mozilla Firefox, Internet Explorer. Just like any other adware it holds no beneficial traits. Although adware applications are not extremely dangerous by themselves, users are still advised to remove Ads by Fraven right away as it might turn out to be the reason other infections could infiltrate their system. This particular application was crafted by Robokid Technologies and has been distributed around the internet for quite some time now. 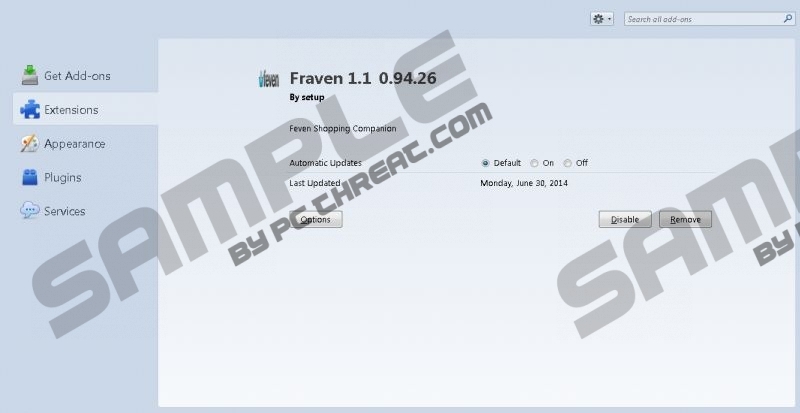 Ads by Fraven is possibly related to such adware applications like Ads By Freeven Pro and Feven Pro. A slight change of the name indicates that creators of these applications are trying to prolong their lifetime. In a technical sense, Ads by Fraven does not differ from its counterparts. All of the adware applications whether they are of Ads by Fraven group or not exhibit very similar features. The almost universal features are commercial adverts and annoying pop-ups displayed within your browsers. It was noticed that Ads by Fraven affects exclusively Mozilla Firefox and Internet Explorer. But you should not feel safe if your default browser is Google Chrome because creators of adware applications are able to update their software simply. In this case, it is possible that your Chrome browser could be a target in the near future. That is why we firmly advise you to implement a licensed antimalware tool as it is capable of detecting and removing virtual threats like these in a timely manner. Furthermore, displayed adverts by Ads by Fraven could contain redirect links to suspicious third-party websites. Often adware publishers do not review links of their third-party associates. Therefore, it is probable that those links could be of malware distributors. Cybercriminals tend to setup hoax websites in order to steal your sensitive data (bank account details, social security number, home address, name, date of birth, etc.). These websites usually mimic some popular website in order to manipulate users. Thus, it is quite obvious why you must not click on any third-party links while software like Ads by Fraven is present on your system. It is important to remove Ads by Fraven even though it is not detrimental by itself. Removal process is not that trickyif you follow the removal instructions that we provide below. But you have to remember that manual removal might not always delete the infection completely. Some adware applications can insert an update file meaning that if you do not remove that file the program could restore itself by connecting to a remote server. Furthermore, connection to the remote server could be detrimental because an update from that server could contain malware applications within. That is why we firmly advise users to remove any virtual threats using a professional antimalware tool. Move the mouse cursor to the bottom right corner of the desktop. Locate and remove Ads by Fraven. Select and uninstall Ads by Fraven. Tap the Windows key on your keyboard and select Control Panel. Remove Ads by Fraven from the program list. Quick & tested solution for Ads by Fraven removal.